I’ve lived in many places during my life, but at heart I’m an Angeleno girl. Los Angeles is my hometown, and the home of the taco. OK, bastardized home of the taco (and home of the bastardized taco). When I was in college and law school and paying flying visits home, I always made sure those visits included tacos. And when we’re talking about real tacos, there is no iceberg lettuce, no shredded cheese, and NO ground beef. 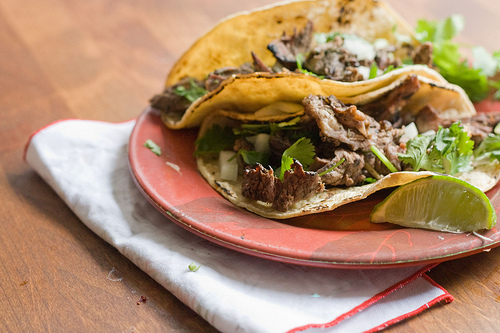 This is a taco: seasoned meat, steamed corn tortillas, onions, cilantro. Maybe a squeeze of lime, maybe a dab of hot sauce. Simple, perfect. Now that I live here, although there are plenty of visits to the local taqueria, I can get all the ingredients to make fabulous tacos at home. The really good kind of corn tortillas. Cilantro for 25 cents a bunch, and limes for a dollar a dozen. The sweet white onions necessary to real Mexican food. And the meat. Any carniceria worth its salt will sell you carne asada — seasoned beef, ready for the grill. But I’d never attempted to make it myself, until I saw the recipe in the LA Times, in an article about the combining of Mexican and Armenian food traditions in one Angeleno family. It seemed almost laughably easy, so I picked up the ingredients at my local Mexican Armenian market — beef flap meat (though any very thin and flavorful cut of beef will do), cilantro, onions, and the ultimate authentic ingredient: Worcestershire sauce. (LA always has been, and always will be, a melting pot). A few whirls in the food processor, some quality time with the grill, and I had my tacos. No need for a taqueria run. 2 lbs. beef flap meat, or any very thinly cut and flavorful piece of beef. In a food processor, combine all the ingredients except the beef, and a teaspoon of salt, or to taste. Blend the ingredients until liquid and rub the marinade all over the beef. Marinate in the refrigerator at least 1 hour, or up to 24. Preheat a grill to medium heat, oil, and grill the marinated meat until the edges are charred and the meat is cooked through -- about 5 minutes on each side. Slice into small pieces against the grain, and serve in steamed corn tortillas with chopped onions, more cilantro, and a squeeze of lime. And a Corona. And a nice view. And beautiful weather. And a lot of traffic. And the smell of flowers. NOW you're in the City of Angels. just returned home from LA, and had wonderful tacos @ Tacos Por Favor in Santa Monica. Will try these to keep the mood going!